Thailand’s growth in the tourism industry continues to contribute a significant amount to the country’s rising economy. It is estimated that Thailand’s expanding tourism industry, including to regions like Hua Hin with revenue number to grow 5.7% each year for the next 9 years, will contribute over 12.8% to Thailand’s total GDP by 2028. Knight Frank Thailand reveals that Hua Hin’s condominium market showed positive signs during the first three quarters of 2018 as land on the coastline is scarce and has become increasingly expensive. La Habana, located only 250 meters away from Hua Hin’s main beach, will be a rare project for investors and home buyers. Starting at HKD 590K, this charming freehold residence by Thailand-listed developer Sansiri, is one offered in Hua Hin’s most affluent holiday neighborhood. Hua Hin traces its aristocratic roots back to the 1800s when the royal family built a number of palaces as their holiday homes away from Bangkok. For decades, Hua Hin’s beachside setting and close proximity to the royal family drew in the upper class of Bangkok, many building lavish residences along the city’s ‘Royal Coast’. The city has since become the playground for the high society of Thailand. Thai aristocracy and socialites bought up properties in the area around the palaces transforming the city into a Thailand’s most prestigious getaway. Today, Hua Hin is additionally joined by wealthy retired expatriates. Tourism is the key driver of Hua Hin’s economy, with visitor number increasing by 4-5% per year and revenue rising 7-8% while hotel occupancy rate grows by 4% on average per year. Increasing tourist numbers have prompted the government to implement infrastructure developments to ease the accessibility to Hua Hin from Bangkok. Thailand’s High-Speed Rail (HSR) will expand to Hua Hin by 2026, reducing travel time to under 1 hour while a new 4-lane motorway will reduce driving time to 1.5 hours by 2022. Direct ferry access from Pattaya to Hua Hin and newly launched flights will expand cross-regional accessibility and increase tourism traffic to Hua Hin. The city’s strong fundamentals, accessible proximity to Bangkok and its upcoming infrastructure developments are expected to lead strong growth opportunities for its property market. Hua Hin’s property market currently lags in pricing compared to other popular coastal cities including Phuket and Pattaya. As such destinations saturate, land plots nearby the coastline have become extremely scarce and expensive. Knight Frank Thailand’s report reveals that from 2012 to 2018, only 35% of Hua Hin’s total developments are situated nearby the beach. Further research shows that condominium prices in the area on average have grown by 41% in the past 5 years with land prices increasing 10-15% per year. Colliers International Thailand reports that the take-up rate of Hua Hin’s condominium market in 2018 was approximately 79% in the first half of the year on average while sold rate averaged at 95%. Sansiri’s La Habana is the brainchild of a team of dedicated designers who captured the charm of the vintage Spanish architecture. Nestled in the heart of Hua Hin’s beach haven, this charming residence is merely 250 meters away from the beach and is at the core of Hua Hin’s popular Cicada Market and Tamarind Market, both just a 1 to 2-minute walk away. More entertainment lies nearby, including Hua Hin’s Bluport Resort Mall, lifestyle plaza Seenspace and world-class golf facility Black Mountain, all within a 5 to 30-minute drive. La Habana is surrounded by 5- stars resorts, including Hyatt Regency Hua Hin and Intercontinental Hua Hin Resort. The residence offers a total of 652 1- bedroom to 2-bedroom freehold units ranging from 270 square feet to 1,060 square feet with on-site amenities including a vintage clubhouse lounge, outdoor swimming pools, gym center and plenty of outdoor space. 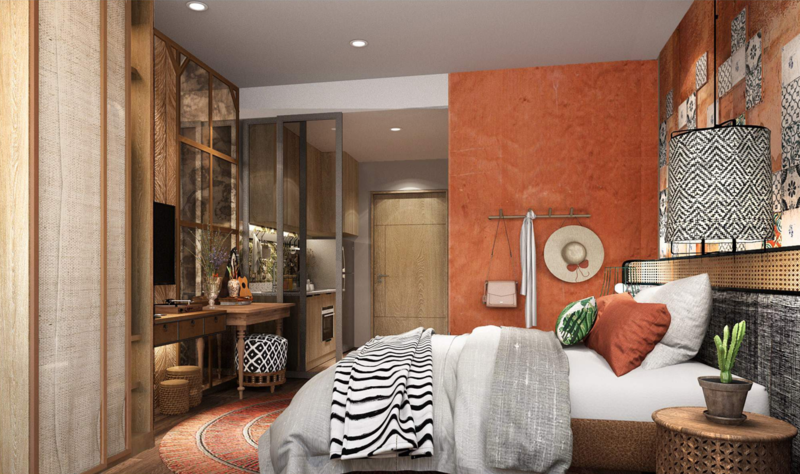 Starting from HKD 590K, a rental yield of 7% per annum and completing in Q4 of 2020, La Habana is the most sophisticated residence drenched with Spanish-inspired designs in the affluent Hua Hin city.